As with my family, my friends didn’t have any children either, but when my best friend from college told me she was pregnant, I happily started quilting away even though she lives in a tiny house on a tropical island and doesn’t need one. At the very least I thought it might be good for tossing on the tiled floor when the babe crawled around. 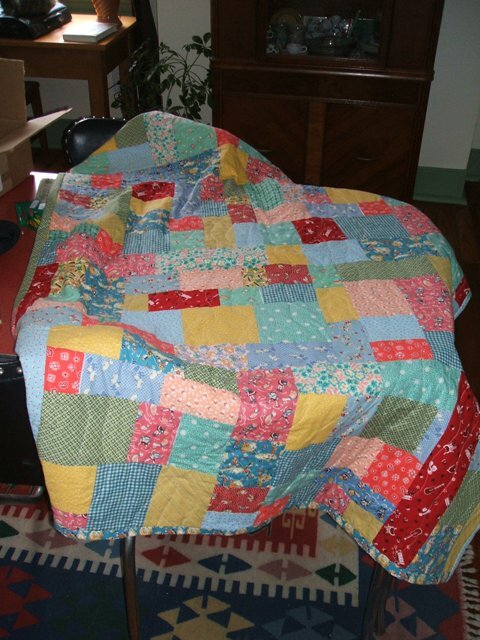 The fabrics were partly left over from the first crib quilt I made for my nephew plus a few others – mostly though they came from a stash of reproduction cotton feedsack fabric that I collected in the late 1990s. I loved the stuff, but a lot of it seemed too “baby” for the quilt I had intended to make for myself. I still have some of it left, so at the very least it will re-appear in something in the future. I think I was also thinking of a millennium* postage stamp quilt back in the day, which could still happen, but I’ll take out the millennium part of it. I also neglected to photograph much of this one as well, which is also too bad since I can’t remember what I did with the back, and I spent a little more time to finish this one a bit better. I believe the quilting was a random wavy line pattern. 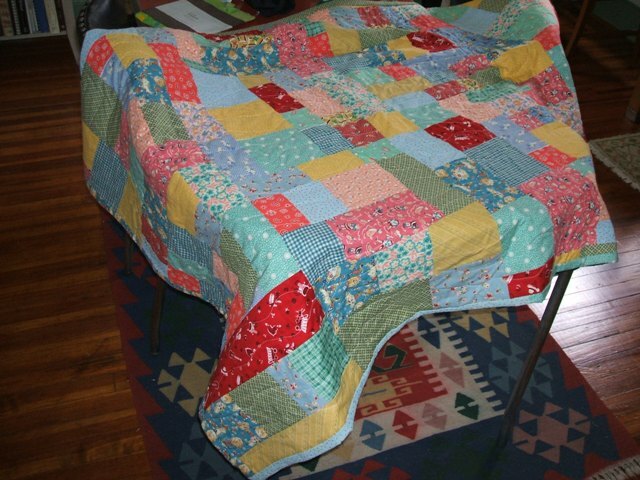 She too has had another child who I have neglected with craft, but hopefully the quilt was used again, or at the very least was re-gifted to someone in a colder climate. *My thoughts of a millennium quilt would have been one made of 2,000 unique pieces of fabric, or maybe I’d cheat and just have 1,000 unique used twice only…I have no idea how much fabric I already have though, so certainly I’d need hundreds more scraps…I guess people who made these were either social or rich, I am neither. Regift? Are you crazy?? This thing is a family heirloom! And we do get what in the tropics passes for “chilly” in the “winter”, when it dips down to the high 60’s at night. I know, it’s so hard for us… But having no glass in the windows does mean we need quilts! It’s gotten and is getting much use. I’ll send you pics of the back. Hey, that’s great! I know space is a premium… And I wish our apartment could be in the high 60s in the winter, inside!